Thursday I met my grandchildren when they got off the school bus after a half-day of school. That afternoon we did what they do at the end of the school year every year. In fact, their mom has been doing it since she was a little girl. What is the tradition? Writing a summer bucket list, of course! 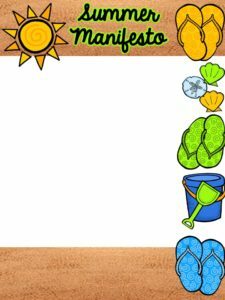 So when I got an invitation today from Kelly Malloy, An Apple for the Teacher, to write a Summer Manifesto, it just seemed like a natural thing for me to do. It looks like I have a good balance of work and play planned. What about you? Do you have special summer plans? 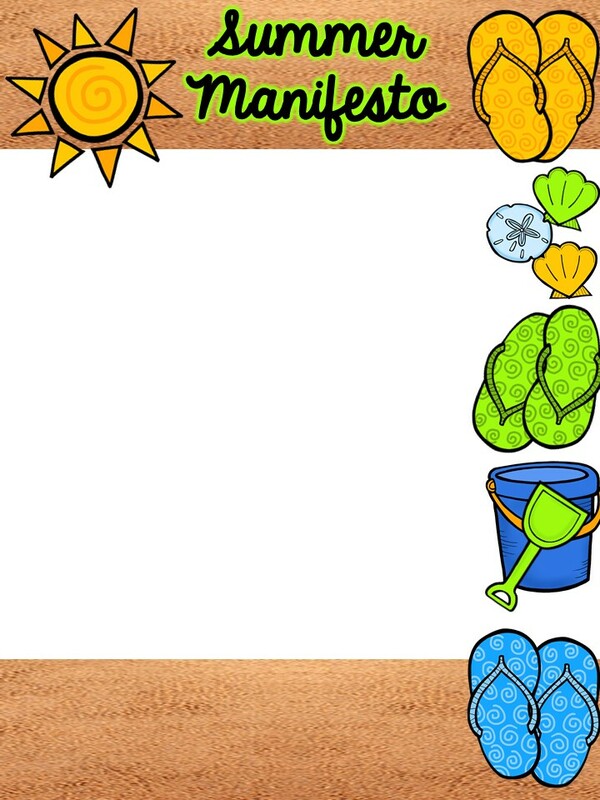 Write a Summer Manifest and post it on your blog or other social media account, use the linky on Kelly's blog to share it. Please link directly to your post vs. your general blog link. If you link up, be sure to comment on at least 3 other blog posts! That's all there is to it! Here is a blank template for you. Just right click it, save as a jpeg, and add your own text boxes to it. Posted in Linkys on June 27, 2016 by Kathleen. July is the best month ever! lol it's also my birthday month! Enjoy your summer vacation and see you in ORLANDO! Woohoo the countdown is on! I hope I do see you in Orlando. Are you gong to the Cool Kids Meet and Greet? Oh, the garden weeds! I've been tackling mine all summer, but finally got them all eradicated today. At last! I hope you have a happy and fun summer! Well, you're ahead of me! I'm still working on the weeds, but I have accomplished a lot in my garden! Grandchildren are an absolute blessing from the Lord. I have 4 of them and love them to pieces! An what it is about offices? Mine always seems to need reorganizing. I guess it comes with the job. Have a great summer. Love my grandchildren! I have 2 boys and 3 girls. I absolutely love doing projects with them! So much fun!